Dr. Miller is the owner of Brooksville Veterinary Clinic. She is originally from Englewood, FL. She attended Florida Southern College for her first two years of undergraduate studies, then transferred to Auburn University for the second two years. She fell in love with Auburn and stayed there for veterinary school, which she completed in May 2010. Dr. Miller practiced at a small animal clinic in Lakeland, FL for one year following graduation. 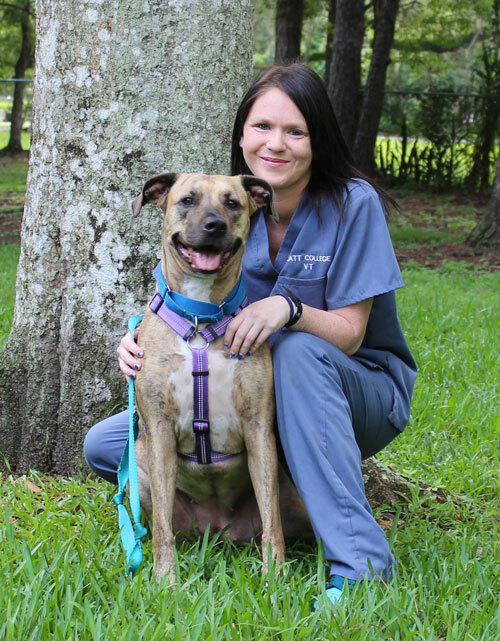 She became an associate veterinarian at Brooksville Veterinary Clinic in July 2011 and became the practice owner in February 2016. She loves all aspects of being a veterinarian, but has a special passion for client education and preventative medicine. Dr. Miller and her husband, Bryan, have two Munchkin cats named Darth Kittious and Spock. When Dr. Miller isn’t at the clinic, she enjoys playing video games, reading, watching movies, and football (War Eagle!). She is also an active member of the 501st Legion, and you can often find her trooping on the weekends in her reserve pilot or TIE pilot costumes with the Tampa Bay Squad. After a successful career as a veterinarian in the U.S. Army Veterinary Corp culminating as the Chief of Surgery at Walter Reed (WRAIR), Dr. Smith and his spouse Ashlyn elected to retire to their Florida roots in a rural farm atmosphere. They enjoy their time between all of their friends and companions: a son in his last year at UF College of Veterinary Medicine, a daughter at USF College of Pharmacy, and their cats, dogs, cattle, goats, sheep, turkeys, ducks, chickens, and of course their llama. Sam was born in Lewes Delaware, and moved to Florida in 2004. She graduated from Hernando High in 2011. In May of 2011 she started working part time kennel at Brooksville Veterinary Clinic. She came back in July of 2014 as a full time kennel technician, and has worked her way to Veterinary Technician. She lives in Brooksville with her Fiancé, Chris. They have 3 dogs, Kato, Kimber and Smokey and a kitten named Nyx. In her spare time she enjoys going Spelunking, playing video games, binge watching Netflix, kayaking on the Chassahowitzka River. She is also a volunteer for the May-Stringer Heritage Museum and does weekend ghost tours. Sam is currently studying to become a licensed Veterinary Technician through the Penn Foster Veterinary Technician program. Kristen is originally from the Tampa area, and moved to Brooksville in 2012. She spent a few years working at a local kennel before joining the BVC team in June of 2015. Her favorite part of working here is getting to enjoy close interactions with animals on a daily basis. In her spare time she enjoys playing video and board games, watching movies, and spending time with friends and family as well as her very rambunctious Australian Shepherd named Charlie. Kristen is currently studying to become a licensed Veterinary Technician through the Penn Foster Veterinary Technician program. Korena was born in Arizona, graduating high school in 2010, and becoming a Veterinary Assistant in 2011. She moved to Florida that December. Korena is studying to be a Veterinary Technician through Platt College and will be graduating in September. She now lives in Brooksville with her family and her 3 dogs, Moo, Roxy, and Sasha. In her spare time, she likes to lay around with her dogs and watch TV, and spend time with her family and friends. Brittany was born and raised in Brooksville, where she attended Hernando High School, graduating in 2011. When Brittany isn’t working, she spends time with her 4 dogs Whiskey, Tucker, Darcy and Spartacus and giving cuddles to her kitty Kung-Pow. Brittany enjoys spending her spare time being outdoors. She loves to go trail riding with her Arabian horse Reeb, bow fishing, camping and spending time with family and friends. Larissa is a Hernando County native and will be graduating Hernando High in the Spring of 2019. She is originally from Costa Rica and is able to speak the Latin language fluently. She completed her Veterinary Assisting Program during her Junior year and is currently enrolled in a Nursing Program at school. Larissa is an active member of Brooksville Senior FFA raising steers for the Hernando County Youth and Livestock Show and is slowly pursuing her dream of having a farm of her own. Larissa has a Kimbertal Doberman named Nino and two rabbits named Rose and Daisy. During her free time, you can find Larissa along Florida’s Coastline adventuring with Nino or enjoying the company of friends and family. 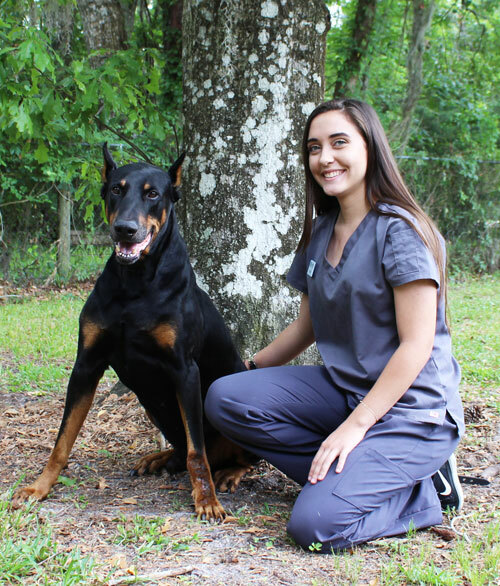 Kayleigh is a Brooksville native and Hernando High Alumni where she completed the Veterinary Assistant Program. She is also a Certified Agricultural Technician and a member of the Brooksville Sr. FFA Alumni. Kayleigh has a Chihuahua named Pumpkin and a Pit/Cur mix named Wee One. She enjoys horseback riding and has an Appendix Quarterhorse named Indian Ridge’s Diesel and a Tennessee Walking Horse named Ultramajestic Design. In her free time, you can catch her exploring Florida’s marine life and nature trails with her horses and dogs. Lindsey was born in Arcadia Florida and has been living in the Weeki Wachee area for about 3 years. She is currently attending Weeki Wachee high school and will be graduating in the Spring of 2019. She enjoys being around animals and has always wanted to work closely with them. When she is not working she likes spending her free time going to the beach, fishing, kayaking and hanging out with friends. Kalyn is originally from the Tampa Area and moved to Brooksville in 2003. She attended Citrus High School and graduated in 2012. When Kalyn isn’t working she enjoys spending time with her family, friends and animals. She also enjoys kayaking and swimming.